DUBAI, 8th February 2015 (WAM) --- Vice President and Prime Minister and Ruler of Dubai His Highness Sheikh Mohammed bin Rashid Al Maktoum, on Sunday welcomed guests at the third Government Summit, held under the theme, "Shaping Future Governments,’ and attended by heads of state, senior officials of international organisations and high-ranking government officials. In a statement, H.H. Sheikh Mohammed bin Rashid Al Maktoum, said that the Government Summit has evolved as a major international platform and established the UAE as a global hub for government development. 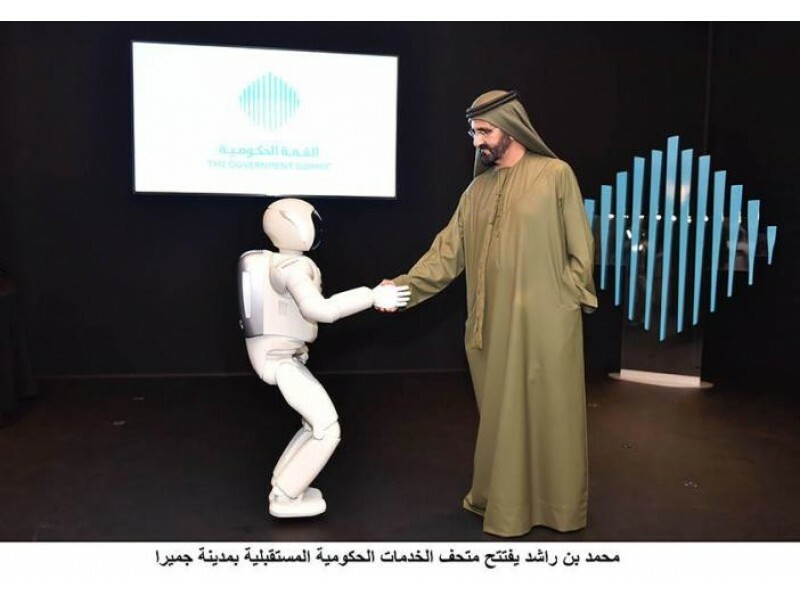 His Highness Sheikh Mohammed bin Rashid Al Maktoum, accompanied by His Highness Sheikh Hamdan bin Mohammed bin Rashid Al Maktoum, Crown Prince of Dubai and Chairman of Dubai Executive Council, also inaugurated the ‘Museum of Future Government Services,’ showcased as part of The Government Summit. Built around a futuristic, interactive, life-sized street, the Museum of Future Government Services showcases how technology over the coming years will radically transform government services in areas such as healthcare, education, mobility and smart city planning. It also features a laboratory for research, design and innovation, particularly for government entities. The Museum of Future Government Services has been developed by an international team of 180 researchers, designers and experts from around the world, and serves as a new approach that will pave the way for citizens and governments to work together to address future concerns. At the opening of the Museum, His Highness Sheikh Mohammed bin Rashid Al Maktoum, said: "Innovation is the key to prosperity, and governments must invest in research, development and innovation more than other sectors because they are closely related to the development of human life. Innovation is the best way to improve the quality of lifestyle, and it is not an option any more but an imperative, especially with the changes and rapid evolution witnessed by the world." His Highness added: "The real development of people is fundamental to the stability of nations. The development process cannot be sustained without creating an encouraging environment to stimulate innovation to identify the best solutions for all the challenges." "We are confident that The Government Summit serves as a solid platform for the world to join hands in strengthening government development. We hope this annual meeting of the world’s governments will mark the beginning of a new era in international cooperation to focus on the development challenges that the world faces through an innovative model of partnership between governments, the private sector, educational institutions and research centres. "The Museum of Future Government Services highlights that the future will belong to those who can imagine it, design it and implement it today. We cannot wait for the future; it has to be designed and built today," added His Highness Sheikh Mohammed bin Rashid Al Maktoum. The opening was attended by Mohammed Al Gargawi, Minister of Cabinet Affairs and President of the Organising Committee of The Government Summit; Khalifa Saeed Suleiman, Director-General of the Department of Protocol and Hospitality at Dubai Government; and Ahmed bin Bayat, Chairman of Emirates Integrated Telecommunications Company "du". The Museum of Future Government Services represents a new approach to government innovation, pioneered in the United Arab Emirates. Representing a significant, design-led approach to policy and innovation, the museum uses design, prototypes and foresight to create real examples of change by engaging citizens and governments in a new way to tackle tomorrow’s critical issues. Although the museum is the first of its kind, it represents a leading example of entrepreneurial governments embracing change and creating futuristic visions for a better world. His Highness Sheikh Mohammed bin Rashid Al Maktoum toured the Museum that presents a compelling vision on the next generation of future governments and the new technologies that will be used for the first time to provide future government services as well as innovative applications that will form the pillar of the next generation of government services. ASIMO, the most advanced robot in the world developed by Honda, displayed its capabilities before His Highness, and is a part of the Museum. The Museum of Future Government Services includes several sections, for example a "smart street" as an outlook for the future by using virtual reality that illustrates how the person will interact with the world around him and how to connect the world with its needs. It also helps governments to understand the public effectively and provide immediate information. The museum also includes a section on "laboratory for future services," adding interactive experience with future services describes cooperate opportunities between government and private sector to explore ways to develop new technologies of future services to reach customers effectively and quickly. Self-driving car concepts have been developed to give a glimpse of the future of the automotive world, integrated with intelligent systems that will bring the concept of mobility to new levels. They include "portal office for more comfortable and productive", "services car to provide better government services to your home," and other practical applications of self-driving cars. It also includes the innovation "personal cloud", developed in collaboration with MIT University, which aims to provide energy efficiency in cooling and heating the place, this section includes sensors determining the position and presence of each person to provide the needed cooling or heating to this exact point and to follow people wherever they move. The museum also has a section called "Fitzania: a healthy and enjoyable life," that encourages children to play fun games while conducting a comprehensive medical examination by medical devices that include, for example, heartbeat measurement, blood pressure and others. The Museum is also explores the future of travel services and health care through the "Health Cafe" that represents the future look of the clinic and pharmacy at the same time. It is equipped with the latest tools that create an atmosphere of comfort and relaxation as well as for the manufacture of personalised medicine based on the results of individual laboratory tests. The "immersive virtual-reality interactive learning lab" explores the future of learning to shed light on how education can travel while we are in the same place by sending a robot to places like Mars to study and analyse the location and then send back data from which students can learn. Through this laboratory we can interact with the teacher robot that explores the surrounding environment, ask questions, study the place analytically, and give students integrated data of any place via information in videos and audio format. The "exoskeleton" is the characteristic structure was synthesised to serve humanity as it helps elderly or disabled people who face movement difficulties, doing the work of fire fighters to protect lives workers as well as assist in the complex construction operations.